Atomberg Technologies is the most popular BLDC fan brand. It has revolutionized the ceiling fan industry with its pathbreaking technology. Ceiling Fans are arguably most ignored appliance when it comes to energy savings. People talk about big appliances like AC and refrigerator consuming lot of energy. After the big appliances focus shifts to small to medium appliances like washing machines, microwave ovens, mixer grinders etc. Even tube lights are something where people find scope for saving energy. That’s why we have seen rapid adoption from normal fluorescent tube light to energy-efficient LEDs. To save energy on big appliances like AC, refrigerator, washing machines etc. manufacturers are rapidly adopting inverter-based circuitry inside to reduce energy consumption. There was a looming need for innovation in ceiling fans for some time now specially to mitigate its energy consumption. That’s where Atomberg has hit the right chord by offering highly energy efficient fans using BLDC (Brush-less direct current) motor. Atomberg Technologies was started by talented graduates from IIT Bombay in 2012. This modern hardware company was started with an aim to eradicate the gap between energy efficient appliance and the air delivery rate, without compromising on the functionality. Atomberg specializes in BLDC fans (Gorilla fan) and you won’t get any ordinary induction-based motor fan from them. In this article, we will explain what BLDC fans are, their efficiency, their benefits and how they are on a cusp of bringing a paradigm shift in the ceiling fan industry. BLDC technology, in general, has been in the market for a couple of decades and it is widely implemented in industries needing high torque motors. What was missing so long is its application in the ceiling fans. That start was done by startups like Versa Drives who offer Superfan and Atomberg which offers Gorilla fans. They are the pioneers of using BLDC motor in the ceiling fans in India. The traditional fan uses an induction motor and typically consumes 70-90 watts. But BLDC fan, on the other hand, can reduce power consumption up to 65%. The latest line up of Gorilla fans consumes just 28 watts of energy. So, before we explain BLDC technology, let us first understand how conventional induction motor used in ordinary fans work. Now, an induction fan has coils on both stator and rotor. 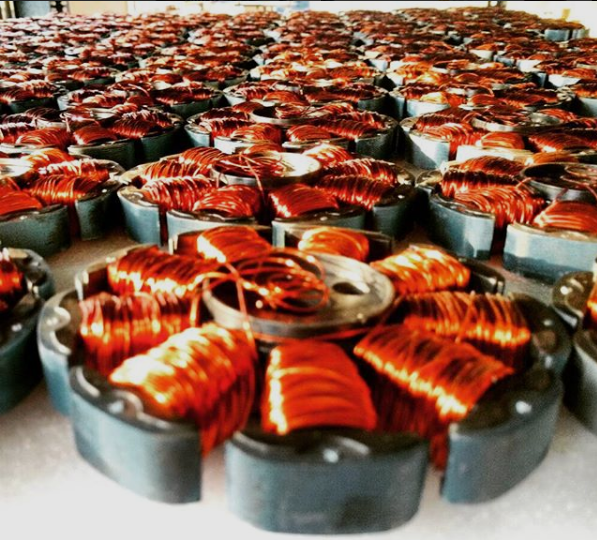 When an electric current is passed through the stator winding electric flux is generated. Based on the arrangement of the stator, current flow accordingly. And upon the flow of current through coil motor rotates due to the induced electro-magnetic field (EMF). To control speed of the fan, speed of this motor needs to be controlled which is done by changing the resistance and thereby the voltage. This regulation is inefficient because a lot of energy is wasted in the form of heat. A BLDC fan, on the other hand, works on direct current (DC) instead of alternating current (AC). This is done by internally converting the AC voltage to DC voltage using switch mode power supply (SMPS). One of the main USP (unique selling prospect) of BLDC fans is they can be controlled wirelessly like a TV or an AC. This is a boon for someone who finds it onerous to get up from a place towards the side where regulator is installed to change the speed of the fan. Gorilla fans come with an infrared remote with many good features like speed control, timer and sleep mode. On the remote you will find 5-speed settings wherein you can press number between 1 to 5 to adjust speed with 1 being the lowest speed setting. Additionally, there is boost button which can provide an additional thrust for a better airflow. In short, you can consider it to ‘6th‘ speed setting. The timer button allows you to run fan for specific hours. You can set the timer to 1 hour, 2 hour, 3 hour or 6 hour. Remote also features sleep mode, which is useful for a good night sleep. Upon activation, it first sets the speed to an optimum level (usually at higher RPM) but as the time progresses it gradually decreases the speed. This it does to match the falling night temperature. It is observed that as the night progresses temperature dips a little. So this way it smartly reduces the speed in sync with the ambient temperature giving you the dual benefits–comfort plus energy savings. As the remote works on infrared technology, you can control the Gorilla fan with mobiles coming with an infrared sensor. Ceiling fan was an electrical appliance which saw nothing much in terms of innovation in the last few decades. But in the last couple of years there has been a rise in an internet-of-things (IoT)—a technology which conceptualizes connected appliances for central control. Bunch of smart graduates from a reputed IIT saw the need to innovate the ceiling fan. Atomberg was born out of this purpose and you’ll see lot of ‘smart’ features which you’ll otherwise notice in big appliances like TV, AC or refrigerator. 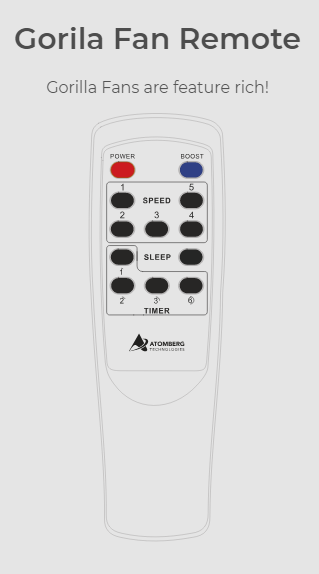 All Atomberg fans come with smart Atomsense algorithm which smartly guides the fan speed and operation to efficiently consume power while ensuring the requisite amount of airflow. Commutation in Gorilla fan is deployed with the help of smart sensors. Theses sensors senses the position of magnet rotor with respect to stator and control the motor-driving switches. Magnetic field in the winding reacts with the field of permanent magnets on the rotor to develop the required torque. Conventional ceiling fans work on alternating current (AC) as they used induction motors. As a result they are prone to Eddy current losses. So, what are Eddy current losses? Well, the magnetic field surrounding a coil carrying AC current varies with time and thus induces voltages in nearby conductive material inside the ceiling fan circuitry. The resulting currents are called Eddy currents. They are called ‘Eddy’ because they flow in circular patterns like eddies in a brook. Eddy current are unwanted and create power losses. Technically, they are called Eddy current losses. They are undesirable because it increases the power consumption of the fan and also lead to generation of heat. This in turn increases wear and tear of the induction motor inside a conventional ceiling fan. But as the Gorilla fans from Atomberg uses BLDC motor which works on direct current (DC) there is no chance of Eddy current losses. You’ll notice that BLDC fans do not get heated as much as their induction-based ceiling fan counterpart (provided they are of same size and run at the same RPM). To control the speed of ordinary fans you need to install a regulator compulsorily. But that’s not the case with Atomberg BLDC fans. They do not come with a need to install a separate regulator which saves cost. And in case you decide to replace your old ceiling fan with BLDC fan you can still keep the regulator in its place. But make sure you set it to maximum level and then control the remaining functions of the fan with the wireless remote which comes with the BLDC fan. Energy saving is the biggest selling point for Gorilla fans. Thanks to its new BLDC technology their fans even at a peak speed consumes just 28 watts of energy. This is way less than ordinary ceiling fans consuming over 75 watts of energy. Atomberg has used good quality of materials in construction of the fan. 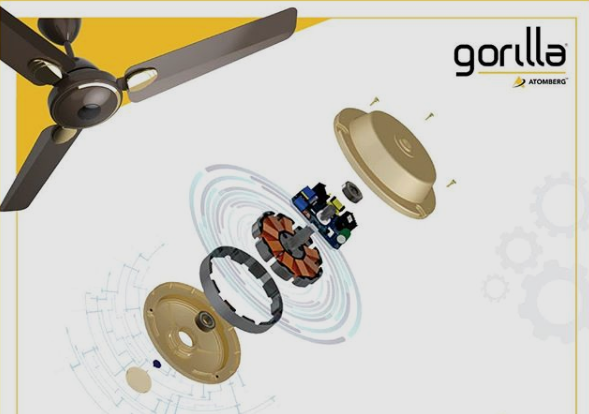 As opposed to sheet metal used in ordinary BEE 5-star rated fans, Gorilla fans uses high quality aluminium in fan blades and comes with rust-resistant property. Aluminium material used is lighter and therefore ensures a better airflow. Also, Gorilla fan uses NSIKI shielded bearing which reduces metal to metal contact friction. This implies a low noise generation and longer motor life. Remember motor is the heart of fan. Gorilla fans were tested in the prestigious IIT laboratories for its quality and they are capable of working even in fluctuating voltages. They can work in the voltage ranging from 110V to 285V. As an energy efficiency aficionado, we don’t have much to remonstrate about Atomberg fans. Cost of the fan is on a higher side; almost double the ordinary fans. But if you intend to use for more than 10-15 hours daily, the cost can easily be recovered in the form of energy saving these fans bring within a year. So, shelling out more money at the onset is a small let off when you decide to go for a BLDC fan. Another thumbs down for Gorilla fans would be design. They don’t offer any fancy variety of fans, even the design of premium fans is pretty basic. We found Crompton and Orient to be the better brands in terms of design and appearance. Despite of numerous schemes launched by the government especially for development in the energy sector, roughly 20 percent of Indians still have no access to electricity—a utility which is considered fairly basic in the modern era. Now, if all fans in India were replaced by BLDC fans (which Atomberg specializes in), five crore Indians would gain access to electricity, at existing power generation levels. That speaks volume about the potential of BLDC fans and its share to improve the condition power-deficit Indian market. Moreover, BLDC fans would be way forward in future as the company Atomberg is working on adding more smart features to its fans and making it the part of IoT. Even big organizations like the IITs, the TATAs, the Birlas have realized the value of having BLDC fans over induction-based fans. They have widely adopted BLDC fans in their offices and rooms. This adoption is not only for energy savings but also for the smart functions like sleep and timer they bring. And this goes without saying that Gorilla fans can conveniently controlled through wireless remote. So, we strongly recommend Atomberg’s BLDC fans if you are a heavy fan user and yearn for the convenience of using remote to control your fan. Also, if your area suffers frequent outages, BLDC fan would be a boon as they are likely to last 3 times more than an ordinary fan on an inverter.